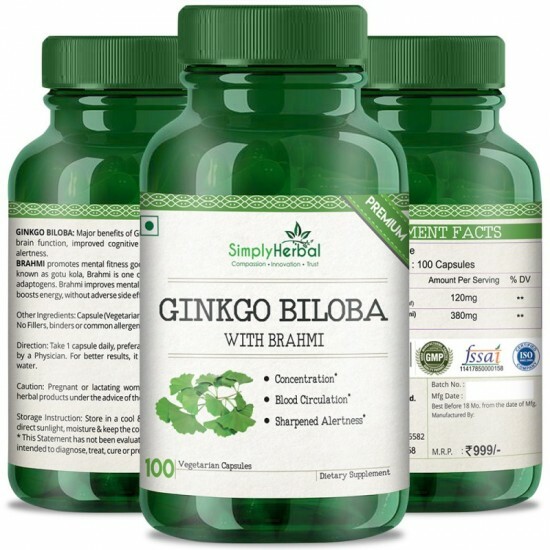 The herb ginkgo biloba has been used to benefit the brain for many years and is now widely used. Ginkgo biloba can increase the quality of memory and alertness. 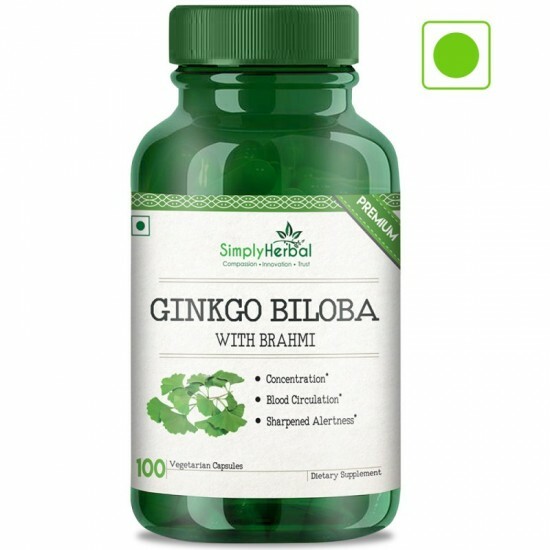 This herb got attention as a potential supplement demonstrating its efficiency in enhancing cognitive function through improvement in synaptic transmission and electrical conductivity in the brain that signals our neurons. Like ginkgo, Brahmi (bacopamonnieri) has also been used traditionally for hundreds of years in Ayurvedic medicine. Brahmi is known to help the cognitive processes that support learning, retention of new information, mental clarity and its ability to enhance circulation in the brain and body and it also provides the feeling of natural energy and mental focus through modulation of certain neurotransmitters. Brahmi affects the hippocampus part of the brain, which is responsible for memory and concentration. It has long been used in Ayurvedic medicine to increase focus and retention. Some of the organic compounds in Brahmi stimulate cognitive pathways in the brain to boost cognitive ability. Ginkgo biloba seems to exert a positive influence on the nervous system, speeding up reaction time. This combination of chemicals and compounds is found in ginkgo biloba only. The other most common reason for using ginkgo biloba is its powerful effect on vision. Not only do the antioxidants in ginkgo biloba help to keep the ocular system clear of oxidative stress but also improves vision. Research has definitively shown that ginkgo biloba extract is able to increase blood vessel dilation and stimulate blood flow to extremities in the body, including the skin and essential organs, properly oxygenating the entire body and boosting energy and strength. Research shows that ginkgo can help combat poor concentration, reverse cognitive decline and heal fatigue. Many of the brain-boosting ginkgo biloba benefits that researchers have discovered rest on the fact that it’s an effective anti-inflammatory that increases antioxidant activity, lower oxidative stress and improves circulation — all important factors for maintaining cognitive health. There are mild analgesic qualities to ginkgo biloba, likely resulting from anti-inflammatory properties in the organic compounds. In other words, when inflammation decreases, so too does the pain it causes. This makes it a popular option for people recovering from injuries or wounds, as well as those who suffer from chronic headaches. Brahmi has also been used traditionally for hundreds of years, in Ayurvedic medicine. Brahmi is known to help the cognitive processes that support learning, retention of new information and mental clarity and its ability to enhance circulation in the brain and body and provides the feeling of natural energy and mental focus through modulation of certain neurotransmitters. It reduces stress and anxiety and treats mental illnesses and digestive issues like diarrhea. Brahmi also prevents hair fall and promotes good sleep. 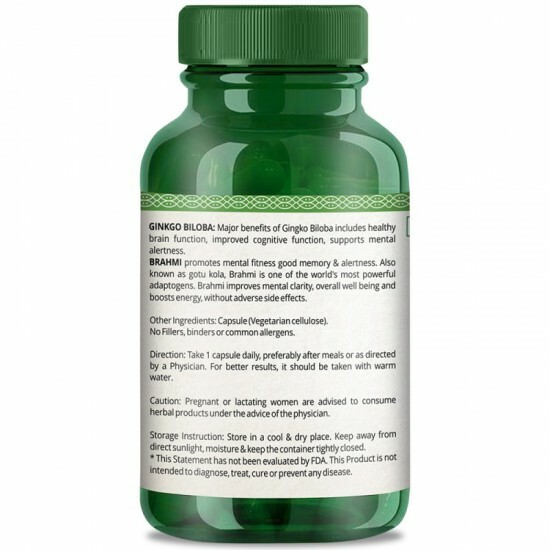 Ginkgo Biloba With Brahmi Helps Support Cognitive Function and Can Help Improve Memory, Especially Occasional Mild Memory Problems Associated With Aging*. Just One Capsule a Day Helps Maintain Healthy Circulation to the Arms, Legs and Brain and Contributes to Mental Clarity.